Two years after its launch, Hay Day remains among the most popular games in the App Store and the Google Play. Supercell has managed to keep its users playing all this time thanks to a policy of updates that brings new functionalities and features to the game. Every few months a new update is available. It can bring new pets and crops or it can be a much bigger update. The last big one was a couple of months ago when the neighborhood was introduced in Hay Day, which creates a community and permit interact with its members via chat. Now, Supercell has launched its biggest update until now: a full town. 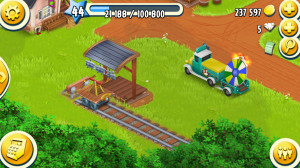 With the new version called Hay Day Town, we can reconstruct and create a village where we can sell our goods. We go to the village by train, the Eggspress, which have the station next to the neighborhood building. With it, we can access the village, where we have a whole new field with expandable areas to construct new buildings and decorate it to your liking. 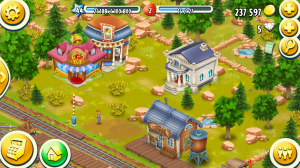 The first time we access Hay Day Town we have to restore the train station and the town hall. We can also construct our first building, the supermarket. Periodically, a train arrives at the station with visitors who want to do something in our town. We will drive them into the buildings we have, initially only the supermarket. Once there, they can buy products from our store. With each sale, we win money and reputation, and once we arrive to an upper level, new buildings and improvements for the existing ones are unlocked. Next to the train station we can find another locomotive, the personal train. With this train, we can exchange travelers with members of our neighborhood. We can go to the city of a member of our neighborhood and help him with any traveler who has waiting. For every traveler who we help, we will win reputation, accelerating our progress. The buildings that we can construct at the moment are: a supermarket, a theater, a dinner, a hostel, a spa and a beach bar. The station is unlocked at level 34 and takes 3 days to be fully built. The update also includes other improvements, such as an increase of the number of members of a neighborhood to 30 and the products to extract from the mine: coal and iron. The buildings we build can receive improvements, either to expand the number of visitors that can hold as to improve its performance. To improve them, special materials are needed, such as stone blocks, bricks, hammers, paint buckets, hand drills or paint tars. We can obtain these materials from our visitors, which once their needs are satisfied will leave us a gift. 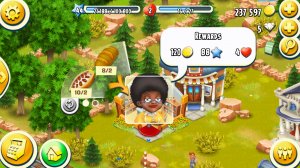 Hay Day remains completely free and has a pretty balanced system of in-app purchases. We can buy diamonds to speed up processes, but if we choose not to buy them, the game will give us a periodic small amount of them; enough to reach the same level that if we decide spend some real money. If you still don’t have it, you can download Hay Day from the App Store and Google Play respectively.